Industrial and technical base of our company allows us to solve the most complex problems, but not apply to only turnkey solutions of our customers. We offer to design and manufacture according to the requirements, to develop manufacturing technologies, to prototype parts without drafts. 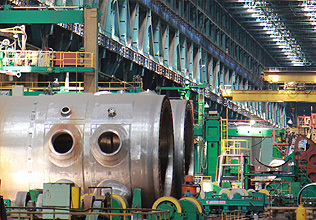 Our customers are leading Russian companies that work in different industrial areas, such as metallurgy, electric power, mining, oil and gas production, nuclear power, shipbuilding enterprises, railways. Our company’s engineering department and advanced equipment we have allow us to provide customers with complete manufacturing cycle. It is easy for us to produce parts of any complexity level. Turning, milling, rotary, planing, gear cutting, chiseling, grinding machines make possible the production of parts, which vary in size, shape and accuracy. Due to the efforts of our employees, products quality, timely delivery and positive feedback from our customers, TPA “HAMMER” was recognized as "reliable supplier" according to the chief of the electronic procurement portal “Fabrikant.ru” in 2014.